This should be a fun group reading. We'll each read for 10 minutes from our own work. Then we'll each read one poem by someone else. I have my extra poem picked out, but you have to come to the reading to find out what it is. There will be a reception that everyone is invited to. I will be baking some really delicious cookies for that. Again, you have to be there to find out what they are. Other people also baking. So join us! You'll be glad you did! Happy Birthday to The Doll Collection! of love made of porcelain, wood, or plastic—bringing out all that is humane in us. of curiosity and caring is revealed—animating the inanimate. It’s now been a year since The Doll Collection debuted. I'm celebrating extra hard since this title was the very first from Terrapin Books. 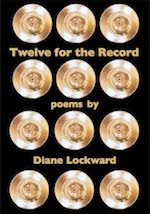 The celebration includes offering the book at 20% off for the entire month of April, National Poetry Month. In fact, all Terrapin titles are 20% off for the entire month. All prices include free shipping and handling. All titles are available in our brand new Store. 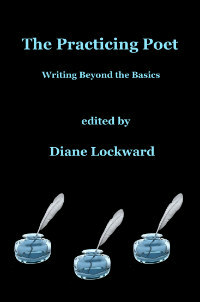 This anthology includes 88 poems by such poets as Kim Bridgford, Neil Carpathios, Chana Bloch, Alice Friman, Jeffrey Harrison, and Cecilia Woloch. See the full list of 89 poets HERE. The Doll Collection has done some traveling in the past year. The first stop was a launch reading at my public library in West Caldwell, NJ. We had a dozen contributors join in, four coming from Philadelphia, a few from NYC, and one from West Virginia. Two of our poets, Jeanne Marie Beaumont and Gillian Cummings, brought their doll collections for everyone to enjoy. I baked a bunch of cookies for the Reception after the reading. This past fall I traveled with the book to Manchester, NH, to participate in the New Hampshire Poetry Festival. There I talked about how I went about starting a small press for poetry and putting together an anthology. Five of the contributors read for our audience. In February I packed up The Doll Collection and traveled to Washington, DC, for the AWP Conference. In addition to having a table in the Book Fair, I arranged a Terrapin Books reading one evening. Fourteen of the poets from The Doll Collection read for us. It was a fabulous reading! 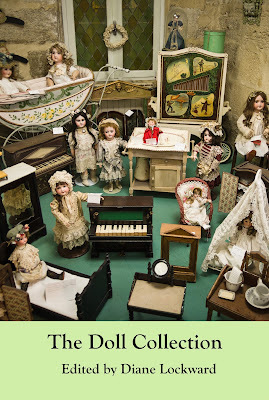 Two weeks ago I traveled with The Doll Collection to the Albert Wisner Library in Warwick, NY, for a reading arranged by contributor Mary Makofske. Eight poets from the book read at this event. And we had more dolls on display. 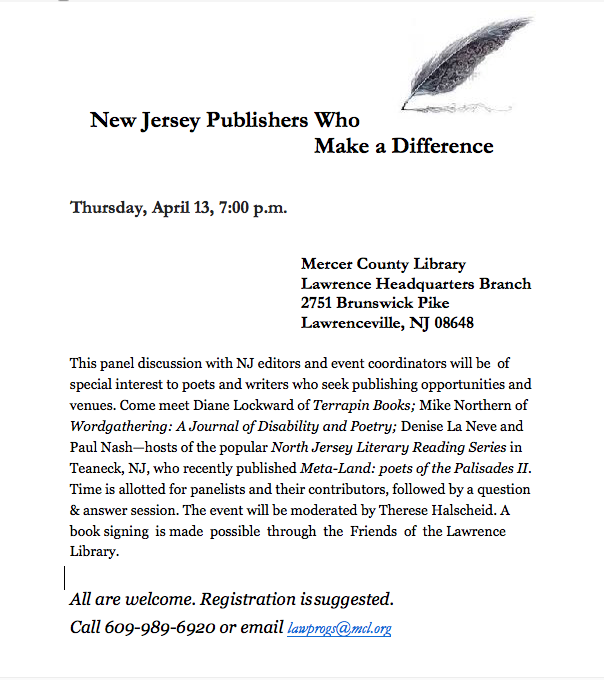 I have one more event scheduled, a panel presentation in Lawrenceville, NJ. 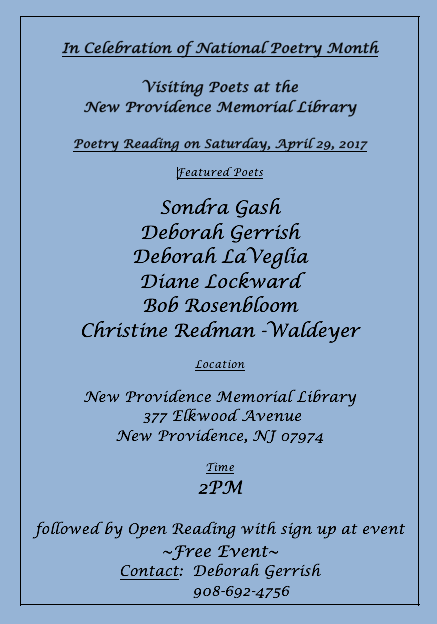 I’ll be talking again about the press, and poets Susanna Rich and Jessica de Koninck will read their poems from The Doll Collection. Please join us.